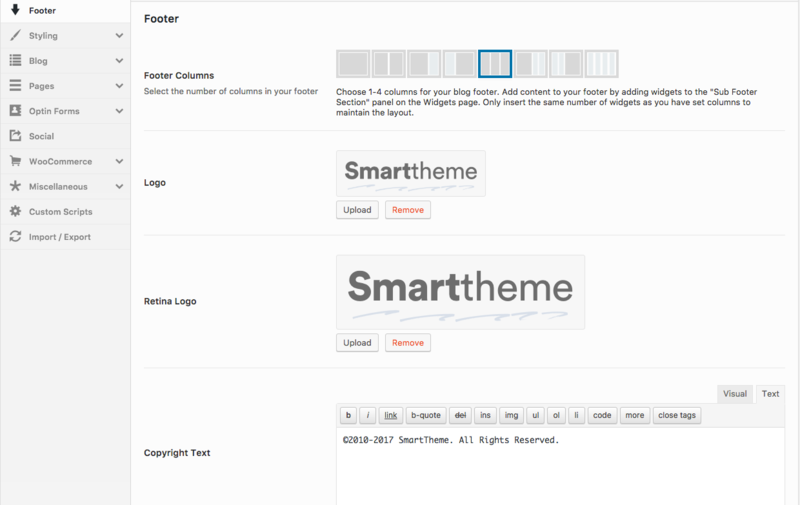 The Footer section under Theme Options > Footer covers the very bottom part of your SmartTheme enabled site. Let me show you the part that we call footer in a Website. This section currently has the SmartTheme Logo and some copyright information we put by default. This is how the options panel of Footer section looks. 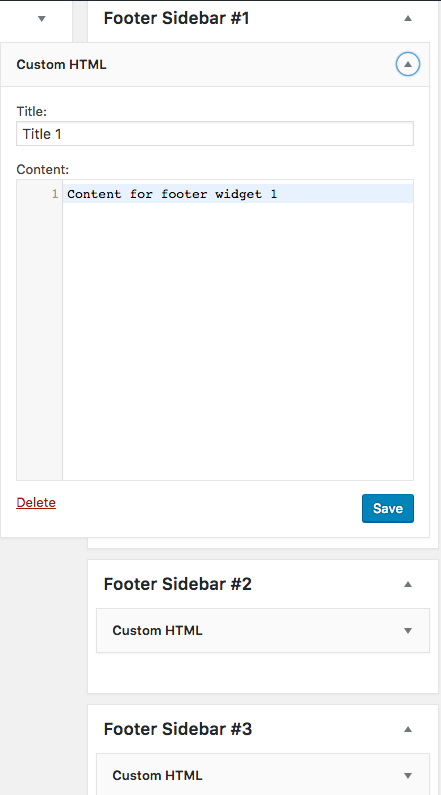 The first option "Footer Columns" defines how many widget areas we're going to have in the Footer Area. The size of each widget and number are defined by the visual diagram. The next options are to upload a logo and High Definition (Retina Logo) version of it like the Header area. You can put your copyright information in the "Copyright Text" option right next to the Logos. It's recommended to use some basic text information there. You can put some fancy content in the Widget area of the footer which I'm going to explain how to do. Below this, we have Footer Background Colour which applies to the background of the entire footer area. Footer Headlines Colour applies to any headline or title that has the Heading tag of html (H1 to H6) inside the Footer Area. Except for the headlines all the other texts of footer area can be changed by the Footer Text Colour option. The last option of the Footer section is Footer Link Colours. It handles Regular Link, hover (mouse over) and active state of any links inside the footer area. For demonstration, I've changed the Footer Background Colour to grey, Headlines to red, Texts to orange and the Links to purple and hit save. And as you can see those changes are implemented right away. Now let's get back to the Footer Columns area for some further clarification. As I currently have a 3 column diagram selected on this option what it does is create 3 widget areas for the Footer area. Let's go to Appearance > Widgets and see if we have it there. Yes. We have Footer Sidebar #1, Footer Sidebar #2, Footer Sidebar #3 there. Now we can drag and drop widgets here to show in the footer as we do with any other regular widgets. I put 3 Custom Html widget on these 3 widget areas with some dummy content. A Title which automatically takes an H2 tag which should turn into Red and text content which should be orange as I set in Footer area earlier. The title which automatically takes an H2 tag turns Red and text content which is orange as I set in Footer area earlier.